What is it that lets you really grow and thrive as a writer? I would ask that of any writer out there regardless of whether they are making a living at it or not. It is a question that I've been asking myself a lot lately. How do I thrive as a writer? Better yet, am I thriving. Even now I am not speaking in terms of the money you might make for an article, that next advance on a book, or as a general web freelancer. No, I have a more basic inquiry in mind. First, it is clear that all of you, my fellow writers, would respond to the question very differently. Each of us has unique motivations that spur us on. Sure, the call for some can be summed up in the Almighty dollar or "making ends meet," but I would object to that for one reason: It just isn't enough for me. Whatever it is that I'm writing about must stir my creative passion. Yep, I said it. I'm treating words as a art rather than a profession. Maybe it is admission that needed to happen because I've not felt that stirring as much lately. I know some writers have worked very hard to secure both quality incomes and steady readerships based on treating writing as a profession, but I have a hard time doing it that way sometimes. It doesn't mean that I can't see that my words have monetary value to some. I can't say I could purely approach writing as art for art's sake. No, that position is not enough to help me thrive as a writer. I don't know if I am looking for any consensus about what might comprise a way to thrive as a writer. No, I think that misses a crucial piece of this little puzzle. I am dealing with the fact that I have secured two book projects that I've chosen to treat as work alone. I find that this decision has impacted my creativity in various ways. I look at that as a mistake I need to correct. For either book to materialize in a satisfactory way, I must seek to infuse them with a bit of that creative spark. Then they will start shining again and I can think about what ideas will come afterwards. Sounds pretty nuts doesn't it? Such dichotomy in myself has hindered creativity. Because I know this, I must now act to correct the course of this vessel. I say a reboot, but maybe it is more about a creative resurrection. 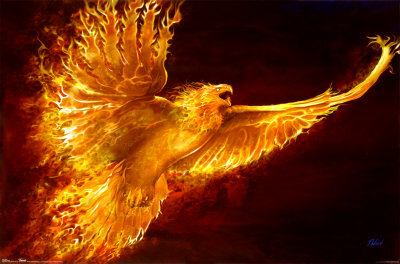 Such thinking springs to mind the imagery of the phoenix, of life, death, and rebirth. Basically, what I'm saying is that it is now my turn to burn! Let's see what rises from the ashes.